Margot: "Well, it's official--the Davis house has Monarch butterflies. They--yes, more than one it seems--are on the patio from early morning until sunset, generally one but I have now seen two fluttering (flirting?) together. And just now our gardener Vivienne brought two more "real" milkweeds--one more for the patio and one for the front, plus another purple plant she says they love to eat. I have to be honest and say their fluttering disconcerts and distracts me a bit when I'm on the patio, but on the other hand, it's the first time I've had an intense interest in anything going on in the nature around our house for a long time. So that's a gift." Marion now has two new milkweed plants and is anticipating the return of Monarch butterflies and caterpillars. Her original plant was reduced to stems after the caterpillars ravaged the leaves. No worries mate: they'll releaf! I also want to thank Marion once again for purchasing and contributing two milkweed plants for the defunct butterfly garden up at Alta Laguna Park. Reports from other sources say that there are a few Monarch butterflies flitting about the park, especially in between the tennis courts. Marion also reports that Anthony, the new Parks Gardener for Alta is taking an interest in the butterfly garden and will devoting some time to working on it. Thank you Anthony! Mid July is when we start to see more and more Cloudless Sulphur butterflies in the So Cal region. More of a subtropical or tropical species, it doesn't present itself in greater numbers at this latitude until the weather sufficiently heats up for it to move up from warmer climes. 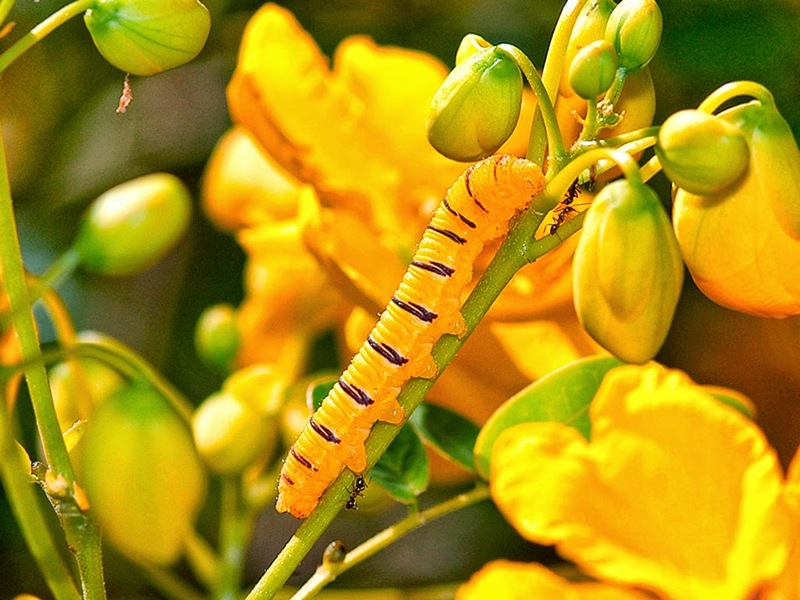 The host plant for this butterfly and several other species of sulphurs are those belonging to the cassia, or senna family. If not planted locally, one won't see many - if any at all - sulphur butterflies except maybe a few passing through looking for host plants. Cassia and senna are synonymous when referring this group: both are taxonomic references that taxonomists (I believe) like to bandy about in order to justify their grants and livelihoods. Don't get me wrong; their role is vital in creating cosmos out of chaos, but the seemingly constant changing of genus species in the taxonomic world does smack of job security to me at times. I've seen "sulphur" also spelled "sulfur" bandied about. I tend to bounce between the two. If I'm feeling rather Continental, I use sulphur; if I'm feeling a bit randy, sulfur is used. A medium sized butterfly, it is striking to behold! 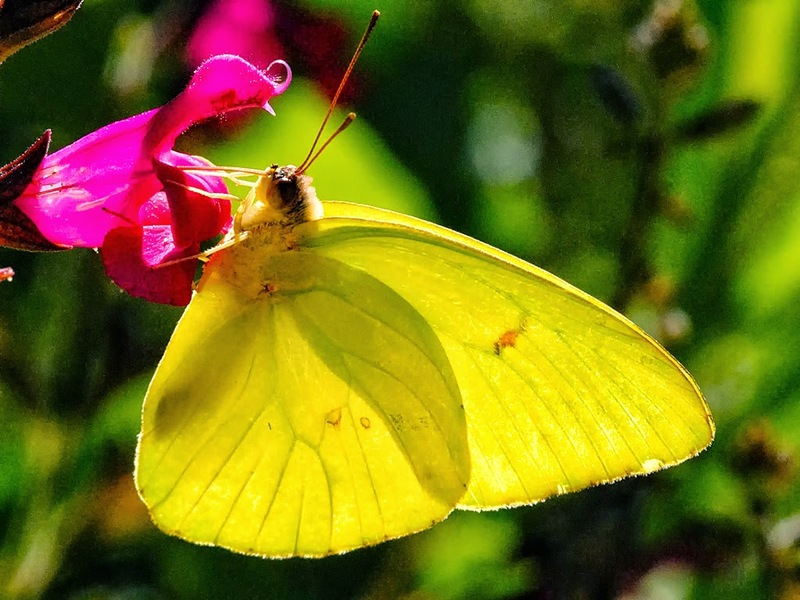 When at rest or feeding on flowers, the wings are normally folded above its abdomen, but in flight, the beauty of a Cloudless Sulphur's sulfur yellow wings are a delight to behold. If any of you have seen the mineral sulfur in its elemental state and have had the opportunity to study one of these creatures up close, one would have to concur that the colors are remarkable. They are fairly easy to approach when visiting a cassia plant if one takes their time to advance slowly. In flight, sulphers are fast and flighty, zigzagging through the air in a seemingly excited state. For those visiting Alta Laguna Park, I planted two Cassia species. The one located at the entrance to the tennis courts is a stellar attractor of sulfurs during the summer. Hopefully, it's still there and thriving! UPDATE: received a timely email from Marion stating that it's still there. 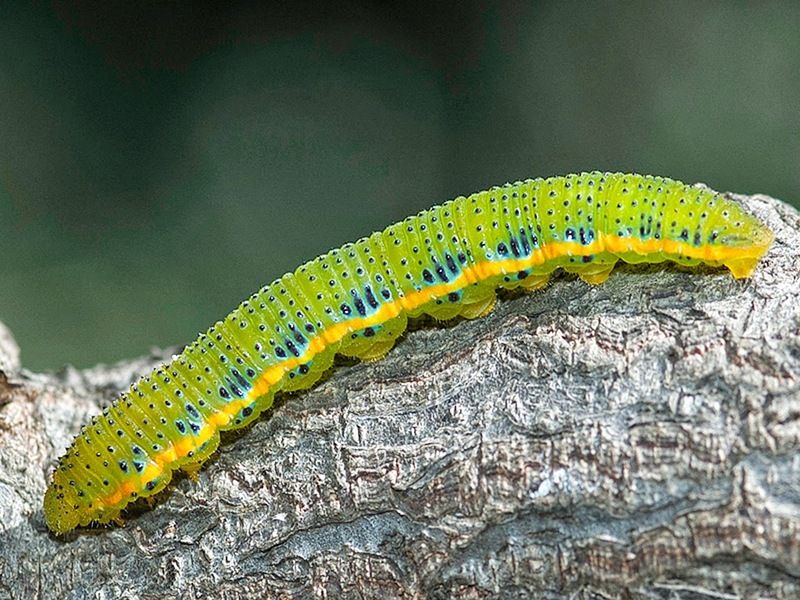 The caterpillars are of interest, as they are dimorphic in coloration. Cassia flowers are generally yellow, the leaves being green. Those caterpillars feeding on leaves are green. Caterpillars feeding on flowers are yellow. This allows them a greater chance of survival against predation. The chrysalides, or chrysalises, are variable in color too, ranging from a straw brown through a reddish brown, to green. 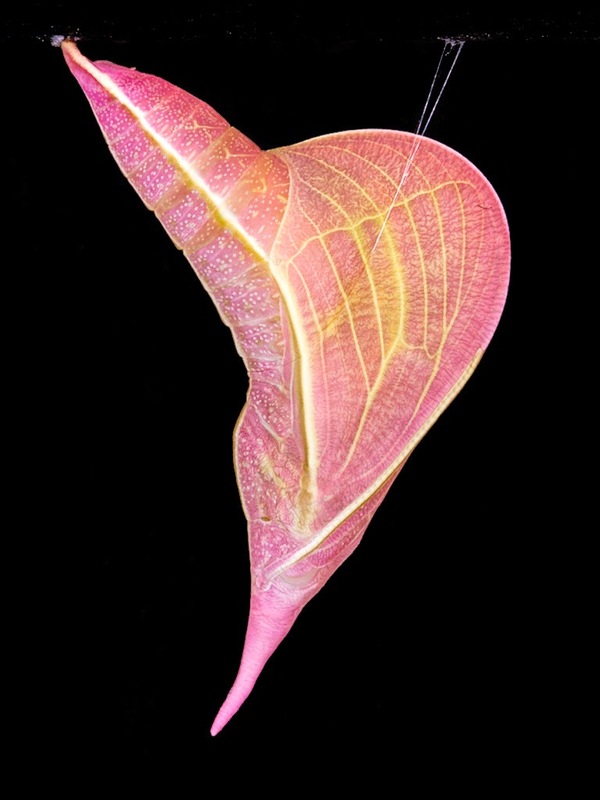 Cloudless Sulphur chrysalis. This one is exceptionally colored. From my observations, Cloudless Sulpher cats tend to pupate on their host plant. I've never found a chrysalis anywhere else but on a cassia. 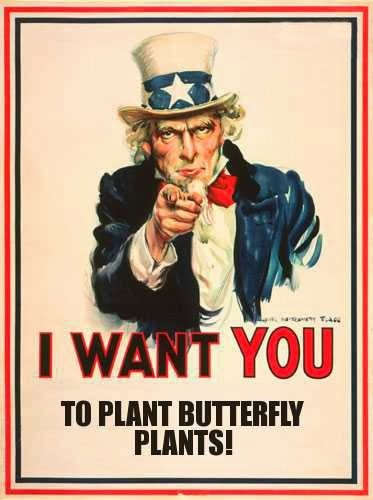 However, other butterfly species will move off their host plant, even if hosting on trees. The cassia family is represented by individuals from midsized shrubs to full grown trees. For shrubs, Cassia bicapsularis is very popular in the nursery trade here in So Cal. This is the one that was planted at the Alta tennis courts entrance. Cassia leptophylla is a beautiful tree that provides nice shade and beautiful flowers in the summer. As Parks Gardener, I planted two C. leptophylla; one by the park entrance and one close to the butterfly garden. They were too small before retiring to notice any benefit to sulfurs, but by now they should also be attracting them. For those of you who are familiar with the Sawdust Festival in Laguna Beach, California, their grounds feature several C. leptophylla, both inside and outside the grounds. During July and August, one can sit under the shade of them at the food court left of when you enter the grounds. Usually, there are at least several Cloudless Sulphurs flitting about the tree canopies. Some years when these butterflies are plentiful, one may see dozens in the cassia trees as people eat at the tables located below them. C. leptophylla is increasingly becoming more of a street tree. The city of San Diego has planted quite a few on their streets and in their parks. Cassias are relatively pest free and easy to grow. Be careful not to plant the species Cassia alata in Southern California, as it is considered an invasive species here. C. bicapsularis and C. leptophylla are not classified as invasive species in So Cal.